Kay Colby (Carole Lombard) is a rich New Yorker torn between two men. Bill Wadsworth (Cesar Romero) is Kay’s fiance, but Scott Miller (Preston Foster) also has a thing for her. In order to eliminate the competition, Scott decides to buy out the company that Bill works for and send him to Japan on business. Scott also eliminates Kay’s competition by sending his own girlfriend, Countess Campanella (Betty Lawford) to Hawaii. Kay’s mother (Janet Beecher) hopes she’ll end up with Scott, so she’s a conspirator in the whole deal… but Kay may be too upset by Bill’s departure for the plan to work. Walter Lang directs Love Before Breakfast, which is based on a story by Faith Baldwin. The film begins with very nice New York City scenery and lively music. This goes over very well, catching the viewer’s eye and ear and setting an uptempo mood for the rest of the film. That pace and mood are maintained throughout most of the film as Kay struggles to choose between her two men. There’s a bit of drama mixed into all of the screwball fun, but for the most part the film pivots on the great comedic banter between Kay and Scott. As we all know, I loooove screwball comedy. It’s my favorite type of comedy and one of my favorite genres overall, so the quips that these two throw at each other throughout Love Before Breakfast were terribly fun for me to watch. 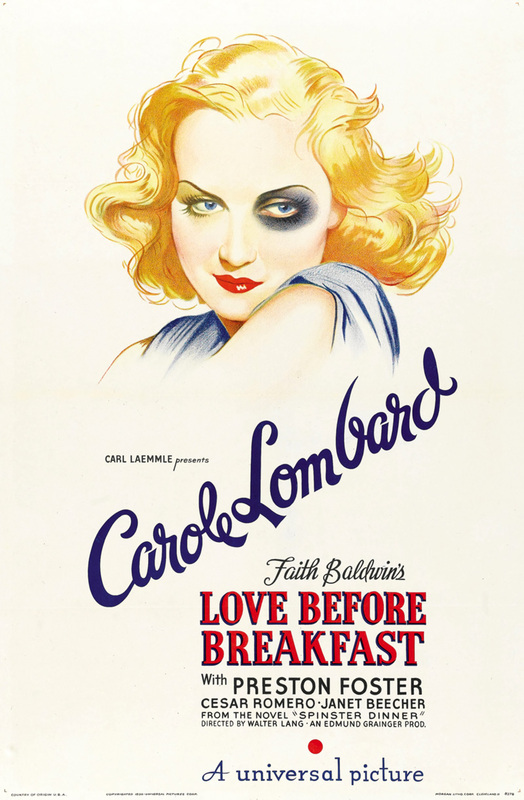 Carole Lombard is wonderful, as usual, and none of the other players come close to stealing the film from her. The character of Kay is full of sass and wit, and the film showcases exactly why Carole was considered the queen of screwball comedy. Hey there! Great review, as always! It’s Award Time again! I have nominated you for The Super Sweet Blogging Award! What a cool poster (and a cool review, of course)…such a modern look for a 1936 poster. In fact, the drawing of Lombard has a style to it that reminds me of the pin-up girl artwork by Vargas! I wish I could find out who designed the poster! I did some extensive googling and was not able to find anything. It’s a great one. I did a little research of my own just now, and like you found nothing…but I did discover a very cool site you might be interested in, with tons of old-time photos and advertising prints for sale: http://www.shorpy.com. I found a few cool travel posters that I might pick up…but be forewarned: you may lose a few valuable weekend hours poring over this site! Ten steps ahead of you! I’ve been visiting that site for a few years. They have some amazing photos of early to mid-20th century Detroit, which is how I originally discovered it, but everything on there is great. Their prints are phenomenal quality as well. I’ve ordered two photos from them and had to stop myself from ordering more due to lack of wall space to hang them all, haha. Cool! That would be my problem, too…lack of available space! The first photo I saw had the ‘Love Before Breakfast’ poster on a fence in front of some old houses…the quality of the photo was incredible. The ad prints are what attracted my attention, though…I’ll probably get the one for a passenger train called ‘The Streamlined Comet’. I just love that Art Deco style.